M. Night Shyamalan fans were teased when they saw Bruce Willis’ Unbreakable character, David Dunn, pop up at the end of his last movie Split. It has been nineteen years since Unbreakable, which pitted Willis against Samuel L. Jackson’s comic book obsessed character Elijah Price aka “Mr. Glass”. In Split, James McAvoy played Kevin Wendell Crumb who suffered from dissociative identity disorder. 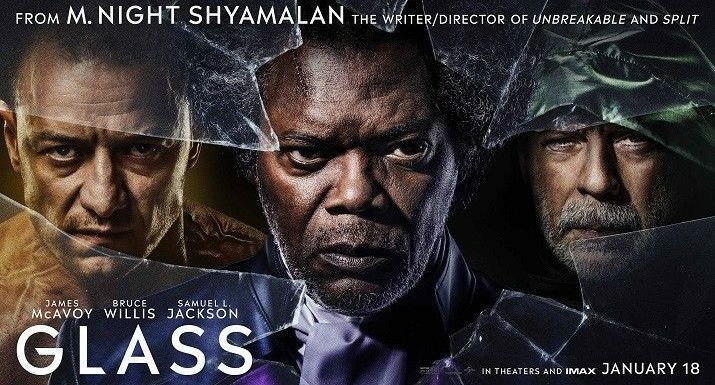 Shyamalan unites all three characters now in Glass. David is now working for his own home security system with his son and uses his supernatural abilities to track down Kevin in a warehouse where he has kidnapped four teenage girls. A chase pursues between David and Kevin’s identity referred to as “The Beast.” They’re both brought to Raven Hill Memorial Hospital, which is also housing Elijah Price. Trying to get to the bottom of these three unique patients is Dr. Ellie Staple who is out to prove that neither of them is the super hero they claim to be.